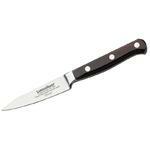 The Santoku is a general-purpose kitchen knife similar to the chef's knife. 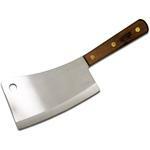 The blade of the Santoku is not as curved as a chef's knife, resulting in more of a chopping motion instead of a rocking motion. It performs well at slicing, dicing, and mincing. The Kullenschliff edge, also known as granton, prevents food from sticking. Descendants from founding craftsman still hand assemble and finish each item, including the final edging process individually ensuring blade’s edge is at the optimal cutting angle for maximum sharpness. 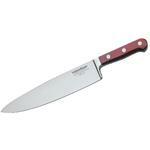 The resin-infused burgundy pakkawood handle is heat and water resistant and provides a comfortable, steady grip. Made in USA by Lamson & Goodnow since 1837. 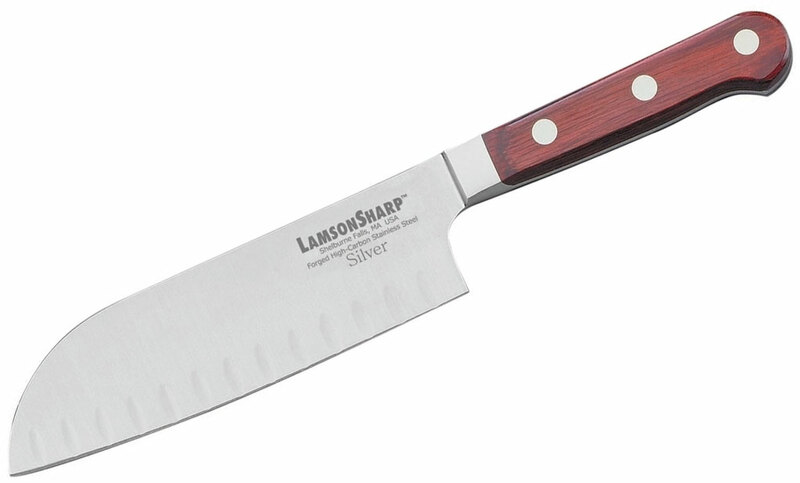 Hey, I wanted to share "LamsonSharp USA Silver Forged 7 inch Kullenschliff Santoku Knife, Burgundy Pakkawood Handles" with you from KnifeCenter.